Finding time and motivation to exercise can seem like another annoying thing on your to do list. Yep, you enjoy your workouts when you can find time to do them. But life seems so full and overwhelming these days. If only there was an effective and efficient way to train for your goals WITHOUT taking over your entire life. In the past it was easy to see results from exercise. Just hit the gym a few times a week and voila, your arms and core were feeling stronger and more toned in no time. But now? Not only is it challenging to find the time to get to the gym, it’s hard to imagine having the energy to exercise as intensely as a decade ago. Your old cardio routines seem boring and lacklustre, no thanks! Your body feels tired and sore, all you want is some strength and stamina. Your schedule is jam packed, and fitting in consistent workouts isn’t happening anymore. You want to see some muscle definition because it motivates the heck out of you. And most of all, you need to preserve every ounce of mental energy you’ve got these days. You want a plan that is simple to follow but SUPER effective too! With a workout plan that focuses on BUILDING MUSCLE and a RESPONSIVE METABOLISM, you can feel strong on the inside and outside again. A program that doesn’t focus on burning all the calories or burning you out mentally is exactly where it’s at. 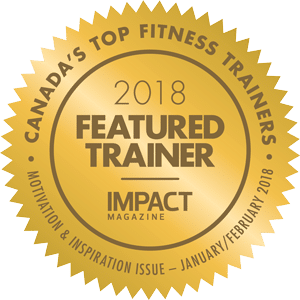 I’m Lana Osborne-Paradis, your fitness trainer and compassionate coach here at the Blast Fitness Coaching Club. I’ve worked in the fitness industry for 15 years and have a deep love for converting high functioning but overwhelmed women into consistent, purposeful exercisers. Training and nutrition are my passion, which is why I have a degree in Exercise Science and multiple post-graduate certifications to my name. My GOAL is to help women feel FIT and CONFIDENT on their health and fitness journey, and I’ve helped hundreds of women overcome perfectionism, self-doubt and overwhelm to craft the body and mind of their dreams. Why? Because after coaching hundreds of women to reach their fitness goals, I noticed a pattern with my clients. The only way we would see results was if we could become consistent with our training, doing at least 3 workouts per week, and focusing on a few basic nutrition habits. The only way we could be consistent was if we kept our workout time relatively short and our eating goals simple. My clients enjoyed these short, sweaty workouts and impactful eating habits tremendously. And one of the main reasons we looked forward to doing these workouts and eating well was because we were able to see some wicked physical results along the way. That’s why I created the 8 Week Muscle Makeover, so you can overcome the overwhelm of a sea of fitness and nutrition strategies and focus on what really works. I don’t want you to feel frustrated or burnt out. I want you to feel motivated and inspired by your own resilience. Consistent strength training is part of your essential self-care, and I want to teach you how to exercise efficiently and effectively. You can build amazing muscles and simplify your approach to health and fitness with the 8 Week Muscle Makeover. It's how I train myself too, and I'm hooked on these short and sweaty strength workouts. It's time to join me and carve out some time for yourself! “Lana, this program rocks. I love the variety in the structure of the workouts. You have me loving working out so much that I am asking for more!” - Jessica O. Yesterday while packing for a trip I noticed my arm muscles for the first time in a long time! Love this program, thanks for all the work you’ve put in.” - Kirstie C.
8 WEEK STRENGTH TRAINING PROGRAM designed for minimal equipment. Do it from home or your office gym in under 30 minutes per workout. PROGRESSIVELY CHALLENGING strength training workouts. There are 26 different workouts in this program, and each week’s training schedule builds on the last. EXERCISE VIDEO DEMOS featuring coaching videos of every single exercise in the program. 8 WEEK CALENDAR to guide you on how to execute the program. ACCOUNTABILITY TRACKING TOOL featuring a daily tracker for workouts, sleep, water, veggies and steps. 4 DIFFERENT TYPES OF STRENGTH WORKOUTS to challenge your body and get better results. FOLLOW ALONG WARM-UP AND COOL DOWN VIDEOS to prepare you for each workout in the program. BONUS!!! 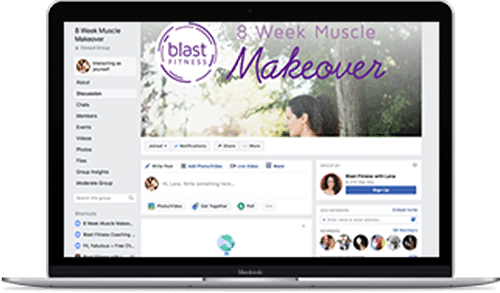 PRIVATE 8 WEEK MUSCLE MAKEOVER FACEBOOK GROUP where you’ll have access to Lana as your coach for personalized feedback and guidance. BONUS!!! HOW TO TAKE PROGRESS MEASUREMENTS INFO SHEET to note your progress through the program without relying on the scale as your main tool for change. “Muscles! I’ve never seen them before! Thank you for this program Lana!” - Morgan M.
"I am loving the Muscle Makeover workouts! Just finished a great lower body workout in 22 minutes with kids sleeping. Now I have no excuses with workouts that take so little time.” - Jessica G.
The 8 Week Muscle Makeover is for women who want to see more muscle definition within a limited time commitment each week. We’ll makeover your work out strategy to teach you how to get maximum results in the minimum amount of time. We believe exercise should be enjoyable, challenging and most of all, an efficient use of our time. We believe that resistance training is the foundation for seeing the best results from any type of exercise. We don't believe in slogging away for hours in the gym. We believe in building fitness programs that choose intensity over duration. You'll find it easier to get your workouts in from home in under 30 minutes a day. Simply put, we believe in giving you the tools to prioritize yourself. We will teach you how to create a strong body that allows you to enjoy and excel at your passions, adventures and goals. 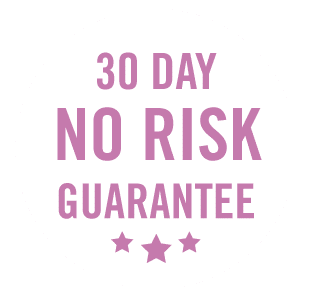 30 Day Money Back Guarantee - I have complete faith in this program, so I have a 100% No Risk Guarantee. I’ve put my full personal and professional experience into this program. All I ask is that you follow this program with your best effort. If within 30 days you’re not satisfied, I’ll give you a full refund. make your outer strength match your inner strength! Are you ready to BUILD amazing muscles, BOOST your metabolism, and GAIN back the energy to life your best life? Join the 8 Week Muscle Makeover to level up your results. For The 8 Week Muscle Makeover, what's next? You’ll be directed to the cart where you’ll begin your investment in making over your muscles. You’ll receive an email with details to access your fully downloadable program from my website and an invitation to join our private coaching group. You’ll get immediate access to the entire 8 week program so you can begin your muscle building journey right away. You’ll join hundreds of women who are seeing more muscle definition with efficient, effective and enjoyable workouts. Your body is worth the time and effort. You don’t have to feel lethargic and fatigued each day. You don’t have to wish for body confidence, you can create it! I want to help you boost your energy and pride. Teaching you how to exercise efficiently and build beautiful muscles is my life’s journey. I know this will be a transformative experience for you. I know you’ve got questions. I’ve got the answers! What type of equipment do I need to complete the Muscle Makeover workouts? To complete the 8 Week Muscle Makeover workouts you’ll need access to a mini band, a few sets of dumbbells, a workout bench and a mat. How many workouts per week do we complete in this program? The time commitment for this program is 3-5 workouts per week plus stress reducing activities like slow outdoor walks. You can modify the program as you need, but you’ll see best results with strength training at least 3 times per week. I have a packed schedule, how long will the workouts take me to complete? The workouts in the 8 Week Muscle Makeover are between 18 to 30 minutes in length. I like to run and do cycling classes, will this fit into the Muscle Makeover plan? Yes! Many of our members are runners and cyclists. They enjoy the muscle building, injury preventing benefits of our strength workouts. We work to personalize your training schedule via our private Facebook coaching group. I have a personal trainer or gym membership, can I do this program simultaneously? Yes! Many of our members work one on one with a trainer in person or are members of a gym. 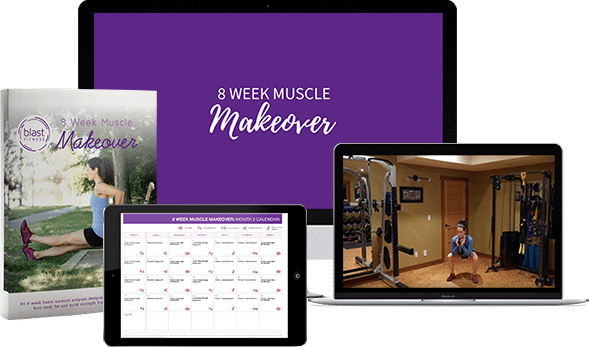 The 8 Week Muscle Makeover program is a great additional benefit to these services as it gives you quick and effective workouts to add to your routine. You’ll have access to workouts for home, travel and the gym along with access to our private members group for more personalized coaching. I don’t have a gym membership, can I do this program from home? Yes. Many of the women who have completed the 8 Week Muscle Makeover work out at home with limited equipment. I recently gave birth, is this a safe program for me? It can be! I highly recommend completing a postpartum recovery series to restore breathing and basic core function and making an appointment with a pelvic floor physiotherapist prior to beginning this program. We have had many mamas complete this program with great success! Send Lana an email at lana@blastfitness.ca for any questions.